Hoofbeats. Hoofbeats. That gentle thudding sound which God had made the beating of horse’s hooves to sound like. I sat to Bounty’s bouncy canter. She was my 14hh bay pony mare. I had always wanted to have a showjumping horse but I struggled to save up enough to even pay for even good jumping tack. My BFF, Victoria Snow rode her big showjumping gelding, Red Hawk or Hawk for short. We slowed down to a walk as we completed our second lap of the Snow’s sand arena. “Are you ready for tomorrow?” Victoria asked as we hosed down our horses. “Of course I am!” I replied with a playful smile. We had gotten permission from our parents to take a camping trip on my family’s 2000 acre property with Victoria’s older and younger brothers and my younger sister, brother and older bro. And to top it off, I would be turning 14! Together, we formed The Ambush Creek Gang. We had named ourselves that because we lived near a beautiful creek called Ambush Creek. Early morning sun rays danced over my 20-acre pasture as I slipped Bounty’s navy blue halter over her beautifully carved head. I soon had her tacked up in full costume. 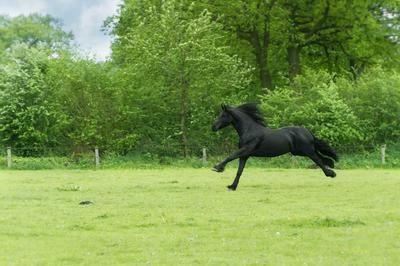 My older brother Robert jogged up with our new horse, Spitfire. He tied the chestnut gelding’s black lead rope to the fence next to Bounty. After we had finished, we rode up to the house to pick up Susannah , my younger sister, and Frederick my younger brother. My tall mother came over to us with a glowing face. “Aren’t you forgetting something honey?” She smiled. “No Ma’am.” I shook my head. I sensed something was up. Besides, Susannah was nowhere in sight. I waited for her to jog up the driveway and lead the way but instead Susannah appeared leading a gorgeous and gleaming black gelding. He had a stunning white blaze and a sock on his left hind leg. He was tacked in a middle coloured blue saddle pad with dark blue trimmings, an elegant black jumping saddle and a classy ebony bridle. I looked at mum confused. “Happy 14th Birthday Mariha! He’s yours!” My family cheered. I hugged mum from the saddle. She’s that tall. “Thank you!” I whispered into her sweet smelling neck. My eyes filled with tears of thankfulness as I grinned at my family. I would have loved for my father to be here, but he was a detective and was away solving a case. I took the stunning gelding for a quick round over the jumps in the sand arena. Everything about him was breathtaking. “So, what are you going to name him?” Susannah asked with a curious look on her face. I had been studying a lot about Sir Edward Pellew with Victoria as a school project. I glanced down from the saddle at my new horse. “I’ll call him Sir Edward Pellew and Edward for short.” I announced to my family. You've got a great start! Can't wait to read more.